People nowadays know about our water whether it is for daily consuming or for using as the time flies are getting worse in the highenist. But, as the technology’s growing, the solutions is coming with the sophisticated machine which purpose to make our daily-using water become healthier without having to make us doing any necessary activities that make us consider whether the water is already clean or not. If you are interested in an system that will remove everything bad (including lots of maintenance), while leaving you with pure great tasting water at an affordable price, then the Big Berkey water filter system is what you are looking for. Lets take a look. Big Berkey Water Filter is well-known in removes every unnecessary things inside the water such as Chlorine and Chloramin, Fluoride, microorganism, Bacteria, and viruses, heavy metals, pharmaceuticals which is including including disastrously hormone-disrupting compounds, are not removed in city water treatment facilities and circulate in the water system. Berkey removes 99.5% of pharmaceuticals including antibiotics and hormones. Berkey Water Filter is also affordable in offering the selling price, what make it special is knowing that it has a high-performance over the features inside the filter. Berkey maintenance is simple. The filters should be replaced every few years, depending on the volume of water consumed by your family. It’s also recommended to occasionally cleanse your Berkey carbon filters. Also, Berkey Filter are good for preparing your home for an emergency scenario. If, for some reason, the plumbing stops working or the water is contaminated, a Berkey works without the requirement of electricity or A Berkey can filter almost any source of water. Big Berkey Water Filter is a perfect water filtration system for small and medium sized families. Big Berkey Water Filter can be used for home, travel and outdoor use for purifying both treated and untreated raw water. So you can use it during travel for purifying water from lakes, streams, and ponds and also in foreign countries where the water regulations are below the standards. Or you can just use it at home to have the best quality of drinking water. The unit is constructed of high quality stainless steel. This system is configured with four purification elements of Black Berkey. The holding capacity of Big Berkey is 2.25 gallons of water. The filter can produce up to 7 gallons of purified water per hour. Big Berkey Water Filter is the unit that once bought one that will make for a lifetime. We highly recommend them especially If you want a solid water system, at one level of purification and have a low maintenance then a large coffee water filter system is possible for you. This unit is so popular that do not waste time if you are thinking of getting one because they sold out quickly. The large coffee water filter system works hard to get it back in stock quickly. Look into trying this water filter system for yourself and recommend it to all your friends and family. 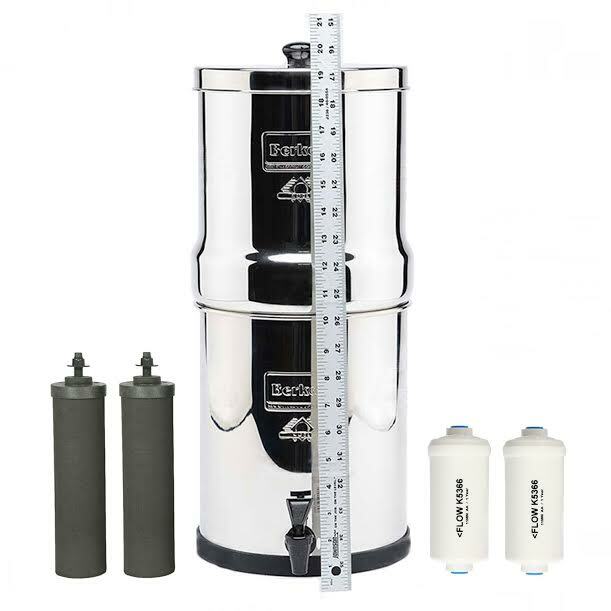 Check the best price for Big Berkey Water Filter here!